At a public meeting inside Poly High School's library Wednesday, Dec. 5, 2018 a community member places a sticker on a map indicating where they would like to see future vote centers in Long Beach. Photo by Stephanie Rivera. 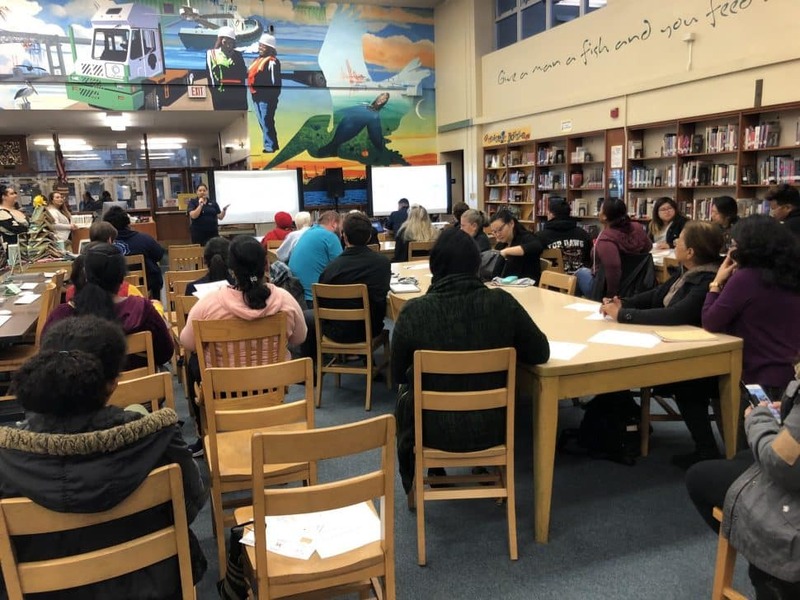 Despite a rare downpour in the usually sunny Long Beach, dozens of community members gathered inside Poly High School’s library Wednesday evening to give their input on what locations around town they would like to see turned into vote centers by the 2020 elections. This was one of 33 meetings scheduled by the Los Angeles County Registrar-Recorder/County Clerk to find out from residents what existing locations can serve as vote centers, which will need to hold large crowds and will be available for use by any voter in the county. “We want to get the community involved, we want their expertise,” said county spokesman Michael Sanchez. Currently, elections countywide take place at polling places, which are only open to constituents in select precincts and can be held in smaller locations, sometimes even in a neighbor’s garage. The switch to the larger, but fewer, vote centers is intended to make voting more accessible and easier as well as eliminate 90 percent of the time people vote provisionally, said Laura Herrera, Voting Solutions for All People project assistant. There are multiple reasons why someone may need to vote provisionally, including if a voter appears at a wrong polling location. In addition to voters being able to cast a ballot at any of these vote centers on Election Day, they will be able to do it up to 10 days before. Herrera said the county is even looking into vote centers being open after regular business hours and even during a 24-hour period. Long Beach resident Sokko Kong said she suggested a location next to Wilson High School because of its open space and parking availability. “I feel like a lot of Cambodian community members will feel safe going to a place that has a lot of parking, easy access as well as somewhere that’s safe and familiar to the community,” Kong said. Community members attend a public meeting at Poly High School on Wednesday, Dec. 5, 2018 to give input on the new vote centers county officials plan to roll out in 2020. Photo by Stephanie Rivera. 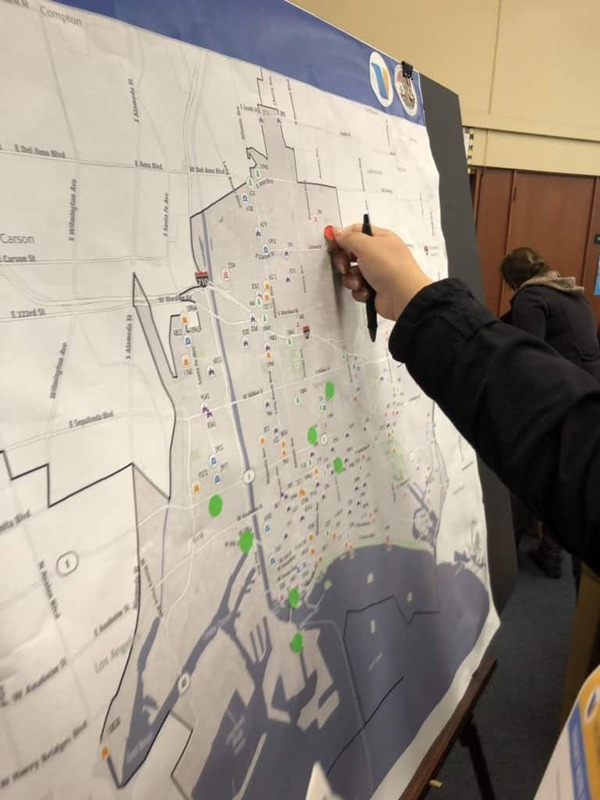 However, some residents brought up concerns about the elimination of neighborhood polling places, mainly the impact it would have on the elderly and disabled population. Herrera said there will be “pop-up” and “mobile location” options as well. Responding to a question about poll worker jobs, Herrera said will some positions will require certain skills, there will be other job opportunities like line monitor or greeter. It is still unclear if the new voting system will improve processing and counting time for ballots or the exact number of vote centers in Long Beach, Herrera said. However, after the meetings end in January, Sanchez said county officials will be going back to the communities to review suggested locations sometime in the middle of next year. The Vote Center Placement Project is part of the county’s efforts to modernize the voting experience and “address an aging voting system,” under the Voting Solutions for All People project which will also include the development of a new ballot-marking device. Click here to submit vote center suggestions online.